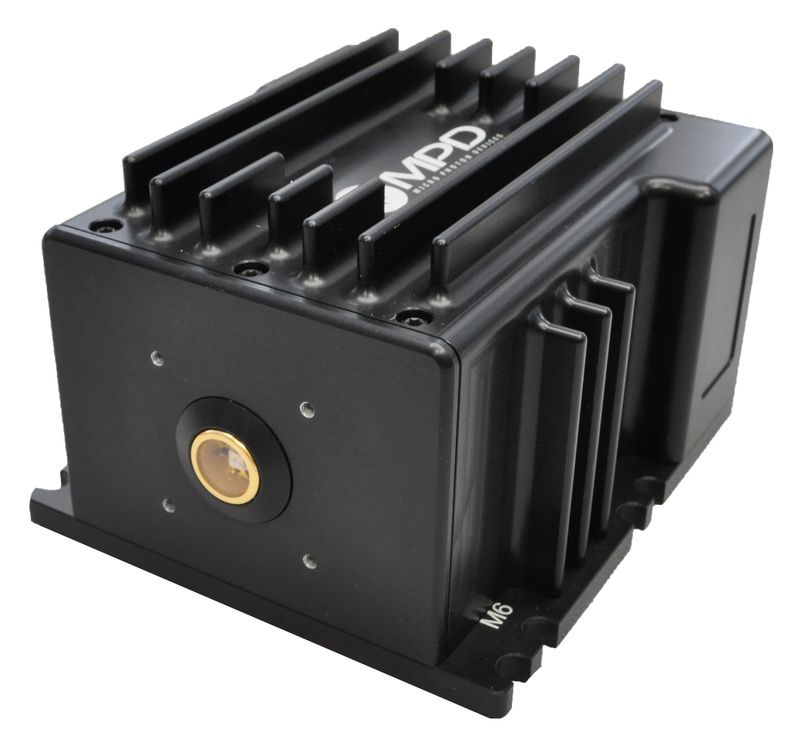 The PDM-IR is a photon counting module based on an InGaAs/InP Single-Photon Avalanche Diode (SPAD) for the detection of near-infrared single photons up to 1700 nm. The module includes a programmable frequency and pulse generator for gating the detector, a front-end circuit for photodetector’s avalanche sensing, a fast circuit for detector’s avalanche current quenching and operative bias voltage resetting and some sub-circuits for signal conditioning. All the main parameters and delay paths are adjustable by the user through the software interface, in order to match the requirements of different applications. The system can be conveniently used both for counting and timing measurements, since the high-performance electronics guarantees a clean temporal response even with fast gate transitions. PDM-IR can work either in free-running or in gated mode and the optical interface can be chosen between a free space and a pigtailed version. The PDM-IR can be used either in gated or in free-running mode. Both modes of operations can be optimized through the use of several user selectable parameters, all controllable from a computer using either the delivered SDK library or the provided Windows® PC software. When used in gated, the TRIGGER GATE signal, for GATE frequency generation, can be provided either using an INTERNAL TRIGGER or through an external signal fed into the TRIGGER IN input. Complex external trigger patterns can be also fed to the TRIGGER IN input, since it accepts not only periodic but also aperiodic signals. Additionally, it is possible to create even more complex TRIGGER GATE patterns for GATE generation, by combining the auxiliary input AUX IN signal with the INTERNAL TRIGGER or the TRIGGER IN, and by using the provided user-selectable logic. Finally, GATE signal can be generated either by exactly replicating TRIGGER GATE or by creating a new signal, synchronized with the rising edge of TRIGGER GATE and with a programmable fixed gated-ON width. When used in free running mode the SPAD is always on until a SPAD avalanche is initiated. In this case, the avalanche current is first quenched and then, after a well-defined programmable hold-off, the detector is immediately enabled. Concerning the outputs: PHOTON OUT is the low timing jitter output signal, precisely marking the photon detection time; NIM AUX OUT and TTL AUX OUT, instead, shouldn’t be used for low jitter timing measurement and the output signal can be chosen independently, on each out channel, among TRIGGER GATE, INTERNAL TRIGGER, VALID GATE, PHOTON OUT and HOLD OFF signals. Independently on the chosen PDM-IR mode of operation, the module has also internal counters that continuously monitor the following signals: TRIGGER IN, AUX IN, INTERNAL TRIGGER, PHOTON OUT and VALID GATE. Finally, in the PDM-IR, all the main signal paths have a programmable delay, designed to help the user in synchronizing the various signals between them and with the external instruments. This feature is very helpful in many applications as it allows to avoid the hassle of continuously changing the cable length.